After a great start in the Royal Oak league last week I was hoping for more of the same in the first round of the V.E.S. today, a league I would dearly love to win again. When I got to the pub for the draw we had the same number fishing as last week although not all the same people, it was nice to see Harry again but Gordon was missing as he’d had an accident at work with a band saw – get well soon mate. 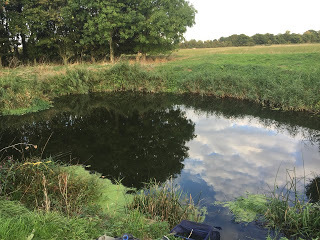 Along with Upper Coxes and Isle Brewers, Rob had put some pegs in at Redbridge and Hambridge for today and I really fancied pegs 14 and 120 although I couldn’t see me drawing the tank traps again! The golden ball today was peg 108 which can be a great peg although I think it’s still a bit early for it. Then it was time to draw, Hurf pulled out a ball but didn’t look at it and then I did the same, he looked first and was over the moon when he saw he had 14, then it was my turn and I was hoping for 120. As I opened my fingers, there was a 1 and a 2 but the final digit was an 8 rather then the 0 I wanted. So I was on the big bend at Isle Brewers which can be a great peg and regularly does big weights but normally a bit later in the season. Adie and Rich S followed me as they were both down there as well, Rich had drawn 126 and Adie was on 129 below me. I showed them both where their pegs were before heading to mine, it’s a big swim and looked really nice although there was hardly any flow. Being a bit pushed for time I only set up a 1 gram Drennan Tipo with 0.10mm bottom and a size 18 B611. As per usual I had maggots, casters and Bait-Tech Super Seed Hemp on the side tray. 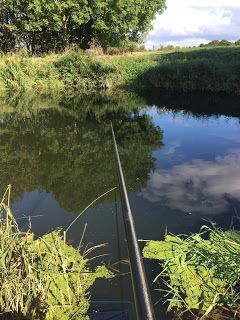 Kick off time arrived and I started off at three sections to hand with caster on the hook and was soon swinging in a gudgeon, I was feeding just to my left and also on the right at ten metres where the flow (what little there was!) comes in and also at the same distance straight out in front of me in the slack water. 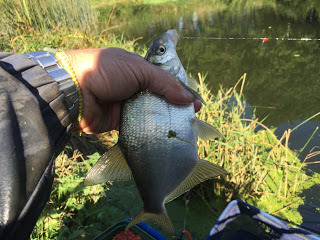 I was getting a bite a chuck but only from gudgeon and I was just thinking about trying one of my other lines, when the float sailed away and I had a 6oz roach, it proved to be a false dawn though and after a few more gobies I shipped out to try in the flow. 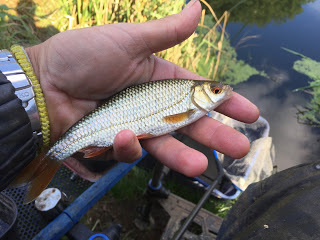 I had a couple of 2oz dace and some small chublets before I started catching gudgeon again, so I tried the other ten metre line and it was a similar story, a nice roach followed by more gudgeon and the swim was full of them! 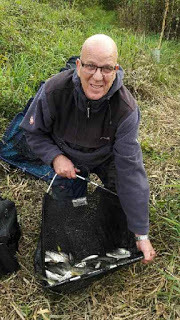 After an hour I’d put 32 fish in the net for probably 1.5lb, the second hour saw my catch rate slow up a bit and I only added 20 fish, I found that if I had a bite as soon as the rig settled, it would be a dace, roach or chublet and if I had to wait, a gudgeon would be the result. I tried going to 11.5 metres and had another brief flurry of dace and roach and there were obviously a lot of fish in the peg but I just couldn’t get the better stamp lined up. During the third hour I added another 24 fish by swapping between the lines but the short line was dying a death. 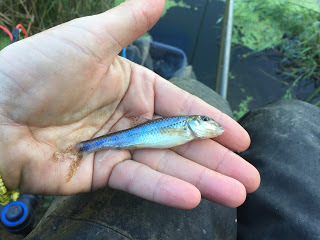 Early in the fourth hour I was fishing at ten metres in the middle of the peg when the float sunk from view and when I struck if felt like a better fish, I slowly shipped back and was slightly surprised when an 6oz skimmer came to the top! I was fishing in the middle of the peg…. when I had a surprise skimmer! 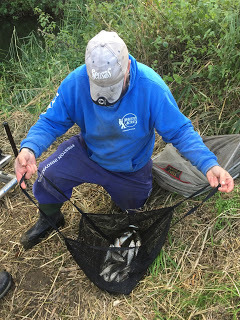 Rob had one last Sunday and a pleasure angler caught one on the Saturday so either this was the world’s most stupid skimmer or there are more in the peg than we think! I was still getting catching quite well and had another 20 fish in hours four and five and was hoping that the better roach might switch on in the last hour but it didn’t really happen although I still added another 19 fish and at the end of the match my clicker was reading 135 and for the second week on the trot I’ve only had a single minnow all day! I thought I probably had 8-9lb which might give me a chance of sneaking in the frame. I had the scales so after taking some of my kit back to the car, I walked down to weigh Adie in first, he had some nice dace and weighed 4lb 1oz although he did lose a good chub, then it was my turn and I was disappointed to only weigh 7lb 10oz and those gudgeon just don’t weigh much. Rich S had struggled a bit to weigh 1lb 9oz which included a nice perch but he’d suffered a lot of pike trouble and landed three! Back at the cars and the two above the bridge had struggled as well, Karl had 1lb 12oz from peg 124 and Fieldy had 2lb 7oz from 123 although both had lost chub. Karl said Harry had packed up early on 108 which meant he had to go up and weigh Steve P in the weir pool, he’d had a lovely day and caught a level 15lb which wouldn’t be far off today. 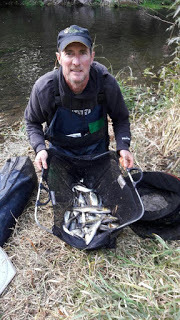 Back at the results and John Dursley had done well at Hambridge and caught five chub and some bits for 13lb 2oz which put him second and Hurf had also had a cracking day in peg 14 and weighed 11lb 6oz of dace and chublets for third place. 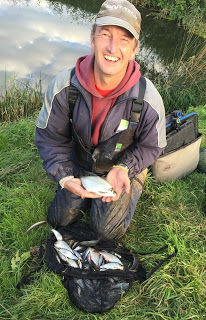 Elsewhere Rob did well in 15 with 7lb 4oz of dace and chublets and Stu Aplin had 2lb 2oz from H1. So I actually finished fourth but with no sections being paid there was no envelope for me today but I at least I got off to a good start in the league with two points. *Thanks to Steve Hurford for the photos. So despite the river being really low and clear, it’s fished well with double figures needed to frame and quite a few chub were hooked and lost as well, once it’s had a flush through and with a tinge of colour, I think we’ll see some big weights. Peg 120 next week please! I'm surprised you guys don't catch a few more of the 2-3lb chub. Do they get lost because you're using light tackle? Still, nice to it fishing well. Need to get my ticket. Love fishing there in the winter. 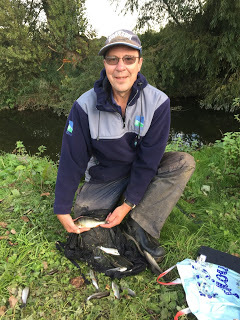 A few were caught at Hambridge, I think some of the losses are down to the river being so weedy at the moment, it needs some extra water and a flush through. Given the conditions, it is fishing very well and I reckon we will see some even better weights when there's some colour on it.